Amann Girrbach trainer and dental technician Barbara Wetzel can draw on many years of experience in the processing of zirconium oxides. Today she reveals some of her tricks and tools with which she gives zirconium oxide restorations their final shine. Processing should be kept to a minimum after sintering to prevent damage to the material. Two abrasives are available in different shapes in the Zolid Sinter-State Polishing Kit to perform simple corrections. Care should be taken to gently grind the occlusal contacts. For this purpose I use the conical grinding disc or alternatively the reverse conical grinding disc (fig. 1). Furthermore, it is important to work with low contact pressure to avoid strong heat development. 3. Monolithic? Polishing is a must! Especially in the case of monolithic work, polishing or high-gloss polishing of the contact points is absolutely necessary to prevent possible abrasion of the antagonist. Ideally, polishing and high-gloss polishing are a two-stage process. With the Zolid Sinter-State Polishing Kit it is very convenient that you can choose between the two shapes "Lens" and "Swivel". The "Swivel" tool adapts perfectly to the tooth surface, also reaches areas that are difficult to access, preserves the original surface structure and is extremely durable (fig. 2 / fig. 3). Especially for larger surfaces, such as the crown margin, I prefer using the diamond polisher from the Zolid Sinter-State Kit in the form of the "Lens". Here, too, the tools are available in two versions for a two-stage polishing system. They are ideally suited for polishing or high-gloss polishing of the crown margin (fig. 4 / fig. 5). 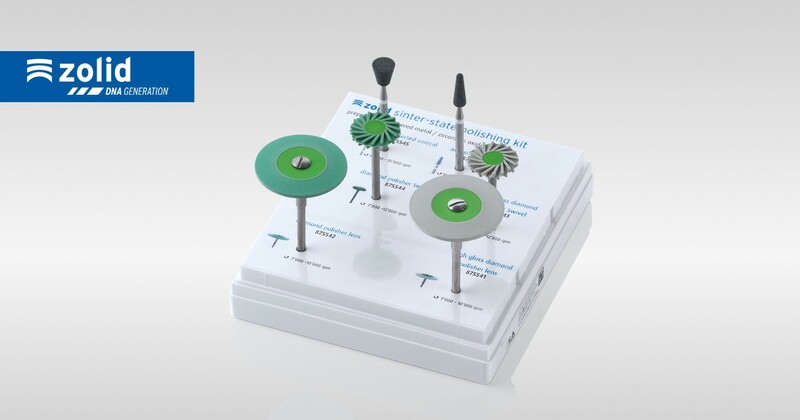 I therefore add the final touch to my zirconium oxide restorations with the Zolid Sinter-State Polishing Kit – which provides me with all the tools I need.